sassyfrazz: "'Twas the night before Easter" Veggie Tales DVD Review & Giveaway!! "'Twas the night before Easter" Veggie Tales DVD Review & Giveaway!! Just in time for Easter and spring time, the all new VeggieTales DVD is just released, "'Twas the night before Easter," and is now available on shelves! 'Twas the Night Before Easter came out on March 8th, and this DVD is a fun children's show (adults like them, too). "It's a 'Hare' raising Easter Adventure! It's Easter time in Crisper County and cable news reporter Marlee Meade (Petunia Rhubarb) is hunting for a way to help others. On a tip that the old town theater will be shut down, Marlee cooks up a plan to save the stage and make a difference through the power of musical theater. With a cast of costume-clad townies, massive props and a 20-foot robot rabbit - Up With Bunnies is hatched! There's only one thing missing the star of the show! When news spreads that singing sensation Cassie Cassava (Melinda Doolittle) is arriving to perform in her hometown church s Easter service, Marlee gets worried. Concerned about the competition, she schemes to steal the starlet for her own pageant! But when things go haywire, will it be curtains for Marlee s dreams or will she discover the true meaning of Easter and what helping others is really all about?" "Up With Bunnies," the musical play ends up a fun show. Cassie Cassava (voiced by American Idol finalist Melinda Doolittle) was coming back to town. She is quite the singer, and Marlee Meade knows it, so she hatches a plan to get Cassie to perform. Things don't go as planned for Marlee, though, however, she learns the true meaning of Easter as well as what it really means to help others. "The Hopperena" is a new VeggieTales song, and my kids loved it. Another fun bonus feature on the DVD is the "Easter Cards" interactive matching game. You can choose the Audio Commentary while you watch the DVD which explains details of the DVD, and there is also Larry's backstage pass to "VeggieTales Live!" My kids loved this DVD, and really enjoyed the classic VeggieTales humor. One of the special features in this video is the information about VeggieTales teaming up with World Vision. This is the ultimate way of helping others - helping those less fortunate. As a little extra incentive for people to sponsor a child, VeggieTales is offering a special Veggie Tales book library worth $50 free with a sponsored child. 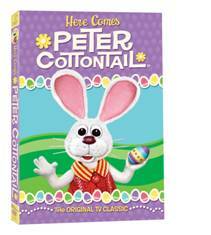 Another TV classic show remastered, Here Comes Peter Cottontail, is perfect for Spring and Easter time. Peter Cottontail wants to be the #1 Chief Easter Bunny and everyone in April Valley agrees...except for his archrival, evil Irontail. Hop along with Peter and his friends as they race through time celebrating all of your favorite holidays to deliver the most eggs...and save Easter for children everywhere! 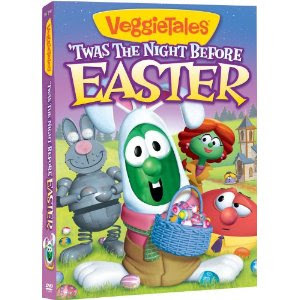 You can win the new VeggieTale's DVD: 'Twas the Night Before Easter. To enter: Do you have a family tradition that you do for Easter, or spring with your family? Comment on something you do together with your family for Easter/Spring. Contest will end Sunday, March 27th, 2011 at midnight. For even more chances to win, like VeggieTale's facebook page, and tell them that you heard about the new DVD release ('Twas the Night Before Easter) on the Sassyfrazz blog...AND thank them for the opportunity to win the new DVD! I received the DVD 'Twas the Night Before Easter from VeggieTales for review purposes, and I was given a second copy to giveaway to one of my readers. I was not compensated for my time or written review. This posting is opinions of my own. My favorite family tradition around Easter is braiding palm branches. It was always a time to spend with family hearing my Dzia-dzia tell stories about when he came to the United States. I liked Veggie Tales on Facebook (http://www.facebook.com/veggietales?ref=ts&sk=wall#!/veggietales) and commented on their post about the DVD. Something we do together for Easter is go to church, for sure! We go to all the local Easter egg hunts for the fun of it (plus momma likes her chocolate;) ). We usually cook a special meal and explain the meaning of Easter, that it's not all about some rabbit that hides candy filled chicken eggs. oh, that google friend followe addition was worth two enteries. Sweetness!! Another comment: we have watched every single Veggietales cartoon, EVER. Did you know to buy the Big Idea library is $694? We typically find some time to spend celebrating the Lenten season, wake up to loud music blaring at sunrise, make the "empty tomb" crescent rolls, and enjoy a time of worship together. This year we're reading through "Amon's Adventure" as a family as well. We have a tradition of making resurrection cookies. Great giveaway, thanks for hosting! I have become a Google Friend follower. Saturday is coloring eggs. Sunday church and then home to hide and find eggs. We celebrate with church, candy, egg coloring, and a big dinner. we do an easter egg hunt w/ our community. We always color eggs and have a Easter dinner with the family! We go to church, participate in the Easter Egg hunt afterwards and have a nice lunch. Thanks! I usually spend Easter weekend either at my Dad's or my Mom's...we switch every other weekend. At my Mom's, we go to grandma's and have a fun egg hunt, and go to church. With my dad, we just do the easter baskets. We always go on an Easter Egg Hunt with Grandpa and Grandma. :) My son was just telling me that they got to watch part of this DVD at church the other night. It looks so cute!! Okay, you KNOW how much of a VeggieTalian I am! I already "Like" them on facebook. I guess I could go tell them I heard about it their new DVD on here...but that wouldn't exactly be the truth. One of my favorite traditions on Easter, is the big Easter Egg Hunt at my parents' house, with all the little kiddos running around gathering plastic, candy-filled eggs. We go on an Easter egg hunt. We go to church, eat a family dinner and have a Easter Egg hunt. We go to Sunrise Services on Easter. 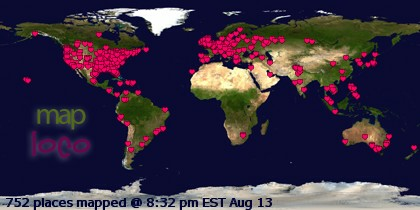 I follow via GFC, one. I follow via GFC, two. We dye eggs the day before easter and we have an easter egg hunt the morning of easter. We always have an Easter egg hunt on Easter. We always had an egg hunt! Then, we 3 sisters would take turns re-hiding the eggs and take turns finding them! Honestly we really don't have any Easter family traditions. We do baskets (from us not the Easter Bunny), participate in egg hunts at school, and of course discuss the Easter story, but I don't know that we really have any traditions.